Is the NSERC leadership bleeding its Discovery program even more than what the government is asking them to? Some say that the termination of the Major Resources Support (MRS) and the Research Tools and Instrument (RTI) programs alone translate into a 20% hit on the Discovery program envelope. Others point to a 60% decline in the numbers of academic NSERC postgraduate scholarships in the past 2 years as another re-allocation away from basic research and advanced academic training. The published figures do show a trend, but what is the true extent of the policy shift, and why is it never clearly spelled out in official press releases? The next step is to figure out what the Tri-council presidents will be doing with the reallocated cash. But whatever they do, we surely hope that they will at least level with the research community. We all know the story by now. The federal government reduced the Tri-council operating budget by $37-million in each of the next three years. On the other hand, each council was allowed to keep their piece of the 2012-13 projected cut, as long as they re-allocate it to “partnership” programs. At least 2 out of the 3 Council presidents issued self-congratulatory press releases. The AUCC is happy. University presidents are happy and VP-Research across the country were asked to be happy. A re-allocation surely beats a cut, but what if NSERC is proceeding to re-allocate more than the government decreed $15-million away from basic research and advanced academic training? NSERC has revealed to the VP-Rs its plan for dealing with the government mandated re-allocation: 1) Terminate the MRS and the RTI programs; 2) Cut the administrative cost by 10%; 3) Share with the 2 other councils a 28% cut to the NCE program. There is definitely something to ponder here. Indeed, even if one factors in that some of the MRS-funded projects (around $5M?) will not be discontinued but simply transfered to other Discovery envelopes, the re-allocated amounts are still high: almost $60M, which amply exceeds the government imposed $45 M$ target in cuts/reallocations over the next 3 years. But let’s keep in mind that, even though the termination of the RTI program could free up cash immediately (beginning next year), the cuts in the MRS program will have to be phased out over a number of years depending on the duration of the grants, which are already in the pipeline. Still, take a look at the slopes in the following graph starting in the year 2005-06, then include (I was too lazy to do it) an additional $60M cut from the Discovery program over the next 3-4 years. and decide for yourself on where support for basic research is heading. But the story doesn’t end here. The PDF and doctoral scholarships, which were supposed to be as “protected” as the Discovery grants, are both down about 25% even compared to last year’s already deeply gutted program. Only 98 PDFs out of 1254 applications were awarded this year, which corresponds to an 8% success rate. Actually, in response to one of our posts, NSERC claimed last year that “if the budget remains stable, NSERC would expect the total number of PDFs supported in a given year to also remain stable”. This should have meant that they were aiming to support approximately 400 (133+264) PDF’s in total each year. It looks however that they are now supporting at most 230 (and perhaps less in view of those from last year who are no longer holding their award). So what happened then to the 2012 federal budget statement committing that “programming in support of basic research, student scholarships, and industry-related research initiatives and collaborations are preserved”? The answer lies in what NSERC also wrote last year to “Piece of Mind”. “Some reassignment has taken place to manage pressures within the S&F suite of programs – for instance, increasing the funding available for Industrial Postgraduate Scholarships and the CREATE program.” This was also re-iterated in the preamble to the 2012 statistics. In other words, NSERC has dramatically reduced the number of academic postdoctoral fellowships and doctoral scholarships (by about 170 PDF’s and 217 doctoral students) in order to fund more “Industrial Postgraduate Scholarships,” and more HQPs in the “CREATE program”, which by the way has now added industrial opportunities as of 2012. So technically, the total number of fellowships/scholarships may have been preserved, but if this is not another re-allocation away from advanced and basic academic research, what is? 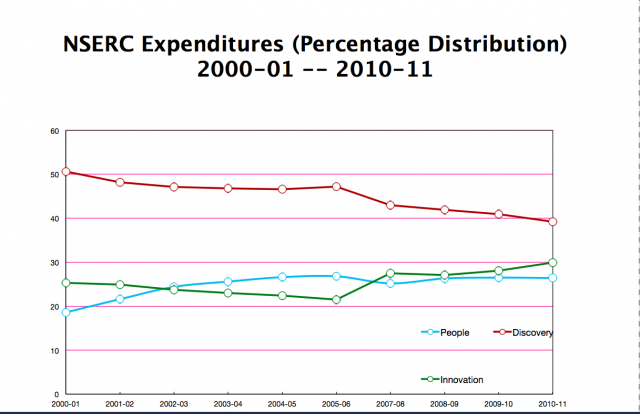 Still, it is surprising that the “People” graph above has been declining since 2008-09, in spite of the addition of the CERCs, the Bantings and the Vaniers. Dear colleague: You obviously deserve better leadership at your institution, but I am more interested in knowing what was your own reaction to such a “door-matic” attitude. This entry was posted in R&D Policy and tagged 2012 federal budget, Basic research, NSERC Discovery, postdoctoral fellowships. Bookmark the permalink. 11 Responses to NSERC’s Discovery Program: Let it bleed? Thanks for following up last year’s posts. I had always felt a bit badly for insinuating at the end of my guest post that NSERC was “obfuscating and misleading”. I thought it more likely that I was just too dumb to understand their numbers properly. Unfortunately, it seems to be apparent that my initial instinct was correct and that NSERC is failing to “conduct (their) business with integrity, transparency, flexibility and accountability” (from their “Statement of Values and Goals”). I have a hard time believing anyone smart enough to do a PhD chooses to do so for any reason but love of their subject and a strong desire to go into academia. While it is surely a sad fact that a majority will not get a tenure-track position, I believe the once reasonable chance of reaching the intermediate step via an NSERC PDF provided much of the necessary motivation to devote years of life to pure science. In the current situation, I don’t see why anyone who’s not a clear future star in their field should bother starting a PhD. Both grad students and faculty (many of whom themselves got their start through an NSERC PDF) should be deeply concerned by these results. Those that are should speak up, either to their department chair, or even to a higher level at the university. With the current government in charge for at least several more years, any change will only come from a large number of people shouting from below. NSERC set the size of the postdoctoral program in clear words, at least in French: “Le Programme de bourses postdoctorales fournit un appui à un petit nombre de chercheurs […]” (http://www.nserc-crsng.gc.ca/Media-Media/NewsRelease-CommuniqueDePresse_fra.asp?ID=355). Unfortunately the English version is not as clear. I’m not sure I understand your point. The issue is that the PDF numbers have been cut substantially from even the average annual number over the past decade, let alone the high of 286 two years ago. It would have been more useful if NSERC had announced a year ago that they’d only be offering 100 PDFs this year…then I wouldn’t have wasted my time! The irony is that many, if not most, of those people who would have been strong enough to get an NSERC funded postdoc in the past will now end up in the US or Europe with perhaps little reason to return to Canada. In contrast, an NSERC funded PDF in the US would be legally obligated to return for at least two years. I find it ironic, and honest, that NSERC focuses on the small number of award when describing the PDF program. Thanks for this article. It was very helpful in understanding this situation. Could you please help me to understand something very simple though? I would like to know where universities now draw funds for capital intensive research/labs. A basic economic understanding of productivity is such that you must combine labour and capital to get anything. I will wager that this still applies to research, especially physical science research. NSERC now funds mostly in labour support and expects to deliver R&D results in the physical sciences with only vague support for anything physical (such as including this physical equipment needs within a Discovery Grant Application)? I’m lost. Unless this is just another frontier of ineloquent herding of the research community into a need to partner with private industry.